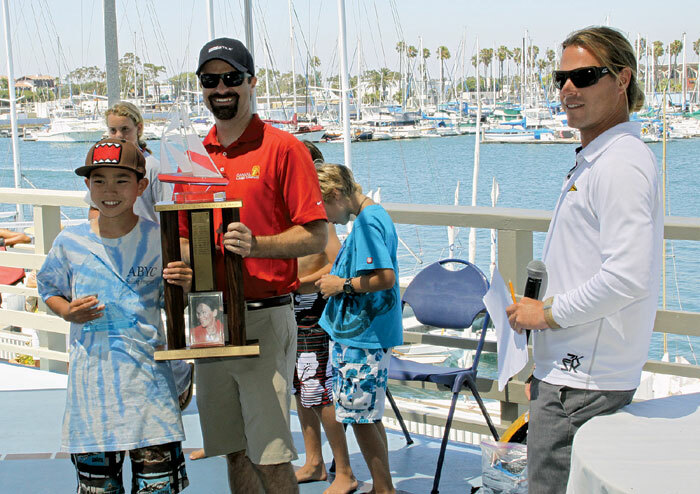 LONG BEACH — More than 140 young sailors ages 6 to 18 competed on the waters of Long Beach Harbor July 26 in the 25th annual Jessica Uniack Memorial Beach-to-Bay Race, sponsored by Bellingham Marine and presented by the Alamitos Bay Fleet as part of this year’s Long Beach Sea Festival. With a breeze building from 3 to 8 knots throughout the morning, the young skippers were escorted by a flotilla of coach boats, volunteers from area yacht clubs and Long Beach Lifeguard boats. They all completed the 5-mile course and found their way safely to the finish line off the flag pole at Long Beach Yacht Club. According to event organizers, this is the only junior sailing event of the year where the 8-foot Sabots ever venture out on the ocean, racing from the east end of Shoreline Marina to Alamitos Bay. Sean Ayale of Alamitos Bay Yacht Club finished first in the Sabot C3 class — winning the Jessica Uniack Memorial Beach-to-Bay Perpetual Trophy for taking first place in the largest class. Other first-place finishers included Kyle Blair of Long Beach YC in Sabot A; Scott Fairbanks of Alamitos Bay YC in Sabot B; Zac Taylor of Alamitos Bay YC in Sabot C1; Lily Maranto of Dana Point YC in Sabot C2; Sawyer Gibbs of Alamitos Bay YC in Lasers; Matthew Warden of Alamitos Bay YC in Laser Radials; Jeffrey Hartwyk of Long Beach YC in Opti; Jacob Rosenberg and Ethan Michaelis of Alamitos Bay YC/Long Beach YC in the Collegiate FJ; and Maximillian Rosenblad of Alamitos Bay YC in Open Bic. The event is named for Jessica Uniack, a tireless volunteer and supporter of junior sailing, who died in 1994. Her husband, Bill, and sons, Billy and Alex, carry on her work with this event that began in 1988 and was renamed in her honor in 1995.